CVGMS is part of a nationwide organization in the USA associated with earth sciences and the lapidary arts under the heading of mineralogical societies. The tree shows our National, California and local affiliations. The AFMS, formed in 1947, is a federation of seven regional organizations of gem, mineral and lapidary societies in the USA. The purpose of the AFMS is to promote interest and education in Earth Sciences and Lapidary Arts. The AFMS sponsors an annual show in affiliation with one of its regional federations. 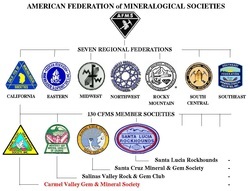 The American Federation of Mineralogical Societies is composed of the following seven regional organizations of gem, mineral, fossil and lapidary societies. Each regional federation covers many local clubs and societies. To find a club or society near you, click on the region that best describes your area. Carmel Valley Gem and Mineral Society is a member of the CFMS. The CFMS was organized in 1936 to bring about a closer association of Clubs and Societies devoted to the study of Earth Sciences and the practice of Lapidary Arts in the Western part of the United States. The CFMS includes over 130 clubs and societies located in California, Arizona and Nevada. The CFMS provides services to its member societies in the areas of education, insurance coverage and legal advice. The CFMS also sponsors an annual show in affiliation with one or more of its member societies. CVGMS consists of adult and junior (pebble pub) members. Members pay annual dues and receive the monthly newsletter, the Prospector. The CFMS was organized in 1936 to bring about a closer association of Clubs and Societies devoted to the study of Earth Sciences and the practice of Lapidary Arts in the Western part of the United States. The CFMS includes over 130 clubs and societies located in California, Arizona and Nevada. The CFMS provides services to its member societies in the areas of education, insurance coverage and legal advice. The CFMS also sponsors an annual show in affiliation with one or more of its member societies.The CFMS was organized in 1936 to bring about a closer association of Clubs and Societies devoted to the study of Earth Sciences and the practice of Lapidary Arts in the Western part of the United States. The CFMS includes over 130 clubs and societies located in California, Arizona and Nevada. The CFMS provides services to its member societies in the areas of education, insurance coverage and legal advice. The CFMS also sponsors an annual show in affiliation with one or more of its member societies. CVGMS consists of adult and junior (pebble pub) members. Members pay annual dues and receive the monthly newsletter, the Prospector. The business affairs of CVGMS are managed by a Board of Directors who are elected annually by the members. The Board consists of the elected officers of the society and is supported by various committee chair persons. The Board meetings are held one hour before the monthly member meetings and are open to all members.